Rc3215, U-DISE Day Celebrations on 30th September, Activities and Guidelines. 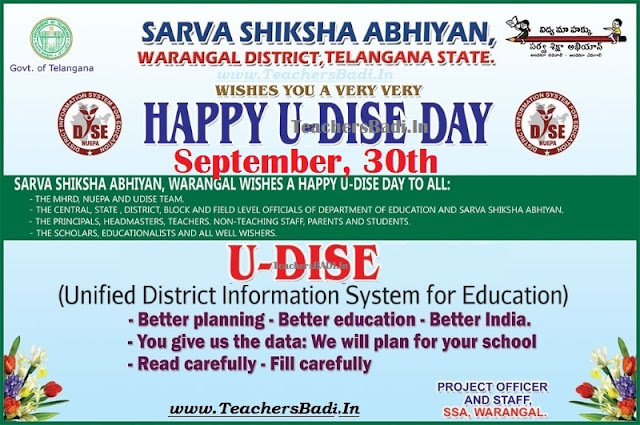 NUEPA has requested to all States and UTs that please OBSERVE 30th September 2015 as U-DISE-Day as the same will create awareness amongst all stake-holders responsible for U-DlSE at School (Head Master/Principal, Head Teachers/Teachers), Cluster and Block levels, District, State and National levels. Subject: TSSA, Hyderabad - Observing 30th September 2017 as U-DISE Day - Certain Instructions - Issued - Reg. All the District Educational Officers and Project Officers of SSA are informed that National University of Educational Planning & Administration (NUEPA) requested all states to observe 30th September 2017 as U-DISE Day as the same will create awareness amongst all stakeholders responsible for U-DISE at school (Headmaster I Principal, Head teachers I teachers), school complex, mandal, district, state and national levels. In this connection, they have also proposed a no. of activities to be conducted at various levels. Therefore, they are requested to issue necessary instructions to all Mandal Educational Officers and Dy. Educational Officers for conducting as many activities as possible at school, cluster and mandal levels. They are also requested to conduct activities at district level and send a detailed report on U-DISE activities at all levels. Subject: U-DISE Day: 30th September 2017 with focus on Student-DCF. All States & UTs are requested to please OBSERVE 30th September 2017 as U-DISE-Day as the same will create awareness amongst all stake-holders responsible for U-DISE at School (Head Master/Principal, Head Teachers/Teachers), Cluster & Block levels, District, State and National levels. Year 2017-17 is special to all of us because of Student-wise data collection as an integral component of U-DISE under ASMITA. Address by SPD and DPC and other officers at all levels and its direct relay to schools, cluster and block centers. 3. Poster-Competition & easy competition in schools. 4. Wearing of T-shirts displaying U-DISE. 5. Give wider publicity of U-DISE Fortnight during which data from across the state will be collected through Print and Electronic Media, SMSs, FM Radios etc. 6. Creation of Groups of Block and District MIS and Other Officers on Social Media(Whatsapp ets) and exchange greetings. 8. Recognition & Award to MIS Officers for Outstanding/ innovative Work (with regard to Coverage, Consistency, Timely Collection of Data, Sharing, Dissemination, Providing School Report Cards to all schools, Utilization, Contribution in SSA and RMSA Plan Formulation in using data etc.) at Cluster, Block, District and State levels. 10. Any other Activity relevant to U-DISE. Please share contributions at arunmehta@nuepa.org and ssaindia@googlegroups.com. Kindly share it with all concerned at state, district, block, cluster and school levels to ensure successful celebration of U-DISE day on 30th, September.